Testing the Limits: Is it Finally Possible to Establish a Limitation Fund in the UAE? In 1997, the UAE became a signatory to the Convention on Limitation of Liability for Maritime Claims 1976 (‘LLMC 1976’) by enacting Federal Decree No (118) of 1997. The limitation regime serves to establish a total liability sum which can be recovered by all prospective claimants arising from any one incident and the calculation of that capped sum is linked with the gross tonnage of the subject vessel. The LLMC 1976 was preceded by the Brussels Convention 1957 and amended by the LLMC Protocol 1996. The 1957 and 1976 conventions provide for lower limitation caps than the 1996 Protocol (as amended) which often leads to ‘forum shopping’ by defendant shipowners. One or more of these limitation conventions has been ratified and enacted through local legislation by the majority of nations across the world. The UAE has not ratified the 1996 Protocol which has the effect of retaining the very low limits of liability of the LMCC 1976. In contrast, the United Kingdom is a signatory to the 1996 Protocol (as amended). However, whilst the UAE has ratified the LLMC 1976, it is widely accepted that the UAE Courts will not constitute a limitation fund in the UAE even if a limitation fund would ordinarily be constituted in other contracting States in the same circumstances. In light of this status quo, this article explores the implications of the judgment in the Dubai World Tribunal (‘DWT’) claim no. DWT-001-2017, ‘The CENTAURUS’, and contrasts this with developments in a case before the Fujairah Court last year on similar substantive issues. ‘The Centaurus’ case was heard before the DWT, a specialist Tribunal constituted in response to the global economic turmoil of 2008. The jurisdictional mandate of the DWT is limited to ‘all claims and demands by and against Dubai World or any of its subsidiaries and the ‘onshore’ Dubai Courts’ jurisdiction is excluded for such matters. The DWT adopts rules and court procedure based on the English legal system, but it applies UAE substantive law. The Tribunal in ‘The Centaurus’ comprised three English judges. 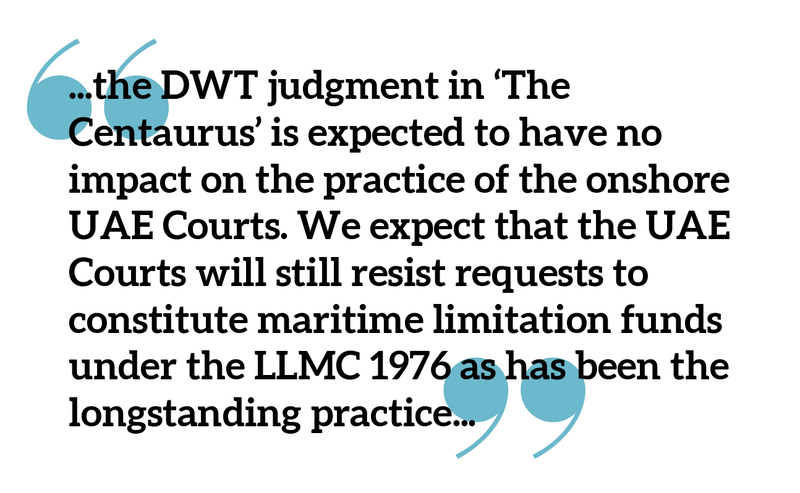 The DWT was asked by the claimant shipowner to either constitute a limitation fund in the UAE, by deposit of a P&I Club letter of undertaking, pursuant to the LLMC 1976, or to make a declaration that a limitation fund for the maritime claims brought against it could be established. Whether the provisions of the LLMC 1976 applied on the facts was not in contention and the LLMC 1976 would ordinarily apply. The crux of the dispute was whether: (1) the DWT had jurisdiction to hear the claim; and (2) if the DWT did have jurisdiction, whether it should exercise it. With respect to jurisdiction, the defendant principally argued that the DWT does not have ‘subject matter jurisdiction’ (jurisdiction to regulate the defendants’ affairs on a world-wide basis) and that the claimant shipowner could not pre-emptively invoke limitation of liability under the LLMC 1976 in a jurisdiction of its choice. If the Tribunal considered itself endowed with jurisdiction (which it did) the defendant averred that the request to constitute a limitation fund (or to give direction as to how to do so) or make a limitation decree should be dismissed and jurisdiction not be exercised because: (i) it is established practice of the Dubai Courts to permit defensive applications for limitation of liability, but not pre-emptive offensive applications where no claim has been brought against it; and (ii) there is no mechanism in the UAE to constitute and manage a limitation fund in the UAE. In support of these propositions, defendant’s counsel submitted that a Club LoU was not considered by the UAE Courts as good security in similar maritime matters such as vessel arrests and therefore should not be considered acceptable in the present case because it would not be accepted by the Dubai Courts. According to the Tribunal no evidence was put before it to support the proposition that pre-emptive actions cannot be made. The Tribunal dismissed the defendant’s arguments regarding jurisdiction on the basis that the LLMC 1976 itself provides for jurisdiction by a contracting State over the defendant to constitute a fund or grant a limitation decree, even if liability is being litigated in a different jurisdiction. Further, it concluded that the DWT has exclusive and unfettered jurisdiction to decide the issue of limitation and therefore the practice of the ‘onshore’ UAE Courts, which had no such jurisdiction, had little or no influence on the DWT’s considerations. The DWT also concluded that there was a lack of evidence for the propositions as to UAE law and practice although it did acknowledge that had sufficient evidence of ‘settled practice in Dubai Courts’ been put before it then it would have been led to follow that practice. Last year, the Fujairah Court of First Instance addressed similar issues to those heard in ‘The Centaurus’. The claim arose from a collision between the parties’ vessels. The claimant shipowners sought to limit their liability before the Fujairah Court pursuant to LLMC 1976 and requested the Fujairah Court to accept the deposit of an UAE bank guarantee to constitute the fund. The defendants, represented by Al Tamimi & Company, raised two principal arguments against the claimant’s petition. With reference to Article 11.1 of the LLMC 1976, the defendants argued that the Fujairah Court was not the proper entity to constitute the fund. They submitted that the Court’s mandate under the LLMC 1976 was limited to considering liability only, and not to constitute or establish the fund itself. On the contrary, the defendants averred that the ‘competent authority’ was the Federal Land and Sea Transport Authority (‘FTA’) responsible for shipping matters and accordingly the Fujairah Court did not have jurisdiction to constitute a fund. Secondly, the defendants asserted that even if the Fujairah Court could constitute a fund, there is no domestically enacted legal framework or mechanism in place to create or govern a limitation fund. To seek guidance, the Fujairah Court enjoined the FTA as a party to the case in the ‘interests of justice’ and to ascertain which institution or body was authorised and responsible for administering a limitation fund constituted in accordance with the LLMC 1976. The FTA submitted a memorandum in the case requesting the Court to dismiss the case on the grounds the Fujairah Court did not have jurisdiction to consider the claimant’s request to establish a fund, because such jurisdiction was reserved for itself, and that there was no legal mechanism in place to constitute a limitation fund. The Fujairah Court dismissed the claimant’s application to constitute a limitation fund on the ground that there is no mechanism for constituting a limitation fund within the UAE. Notably, the judgment specifically recognised that, to date, a limitation fund has never been constituted in the UAE and the FTA has not enacted ‘internal legislations’ to provide for a framework within which a fund could be established. On 24 September 2018, the Fujairah Court of Appeal upheld the Court of First Instance’s decision in its entirety and added that the UAE Federal Law No. 26 of 1981 (the ‘UAE Maritime Code’) applied for the purposes of determining the limitation of liability for collision claims, not the LLMC 1976. The two cases, once again, bring into sharp focus the question of limitation of liability for maritime claims in the UAE. At the time of judgment, it was suggested that ‘The Centaurus’ was a landmark decision which could open the door to parties to establish limitation funds in the UAE, or at least in Dubai. Whilst this may be possible in the DWT, representing a very limited number of cases, in the author’s opinion the DWT judgment in ‘The Centaurus’ is expected to have no impact on the practice of the onshore UAE Courts. We expect that the UAE Courts will still resist requests to constitute maritime limitation funds under the LLMC 1976 as has been the longstanding practice for the following reasons. The DWT judgment, whilst a precedent for future decisions within the DWT, is a marked departure from onshore UAE court practice and application of the law. It appears that the DWT judges applied UAE law in a manner which was inconsistent with that of onshore UAE Courts. The primary justification for such departure was that the defendants did not adduce evidence of the application of UAE law by the UAE Courts or of trends and practice. Whilst we expect that such evidence could have been provided by way of expert evidence, we acknowledge that evidence of precedent would have been difficult to produce given that the UAE Courts do not publish its judgments and judicial practice is not recorded. It is the author’s opinion that the DWT had the prerogative to determine its own jurisdiction and it was within its right to assume it. However, the DWT’s jurisdiction is exclusive to claims brought by and against Dubai World or any of its subsidiaries and so assumption of jurisdiction by the DWT cannot be deemed indicative of what the onshore UAE Courts would do. Indeed, the FTA confirmed that it is the ‘competent authority’ empowered to establish a limitation fund within the meaning of Article 11 of the LLMC 1976 itself. Therefore, it would be erroneous to conclude that the UAE Courts would assume jurisdiction on the basis of the same reasoning that the DWT did. Furthermore, the FTA also commented that it was unable to constitute a fund without extant ‘internal legislations’ providing a facilitative framework for doing so. At a more granular level, the DWT accepted a Club LoU could be used to constitute a limitation fund which is, in essence, a form of security. However, Club LoUs have long been rejected by the UAE Courts as a good form of security. There is no known direct authority on this, nor guidance from the highest Courts of the UAE, yet this is established practice. This was impliedly supported by the claimant’s submission of a UAE bank guarantee in the Fujairah case despite the fact that the claimant shipowner was supported by its P&I Club. In the author’s opinion, the UAE Courts would deem a Club LoU insufficient to satisfy the requirement in Article 11.2 of the LLMC 1976 that the guarantee be ‘acceptable’ to the ‘competent authority’. It may be that the DWT was prepared to accept a Club LoU as capable of constituting a limitation fund because of the emergence of the practice in the English courts subsequent to the Court of Appeal decision in Kairos Shipping Ltd v Enka & Co LLC and Ors  EWCA Civ 217 (the ‘ATLANTIC CONFIDENCE’ case). However, the decision is reflective of the evolution of English jurisprudence, not UAE jurisprudence. Furthermore, the DWT permitted a pre-emptive action by the claimant shipowner to seek to establish a limitation fund guaranteed by a Club LoU despite the fact that the UAE Courts have long considered pre-emptive claims to be unfounded. UAE Federal Law No. 5 of 1985 (UAE Civil Code) implies that a defendant can only respond to a claim once the claimant has initiated proceedings. To this end, pre-emptive claims for declaratory relief or inter-pleader actions cannot succeed in the UAE, despite no express prohibition against them. In summation, the UAE Courts have never before established a limitation fund and there is no indication that this position is changing. The DWT said it did not hear evidence of the application of UAE law by the UAE Courts. As the DWT presiding judges freely admitted, had they been aware of judicial trends and practices then they may have followed the practice of the onshore UAE Courts. It is suggested that the Fujairah Court of Appeal decision will have a far greater impact on clarifying the issue of limitation of marine claims within the UAE and we fully expect that, until a LLMC 1976 facilitative framework is implemented by UAE legislators, a claimant’s attempt to establish a limitation fund under the LLMC 1976 will fail. 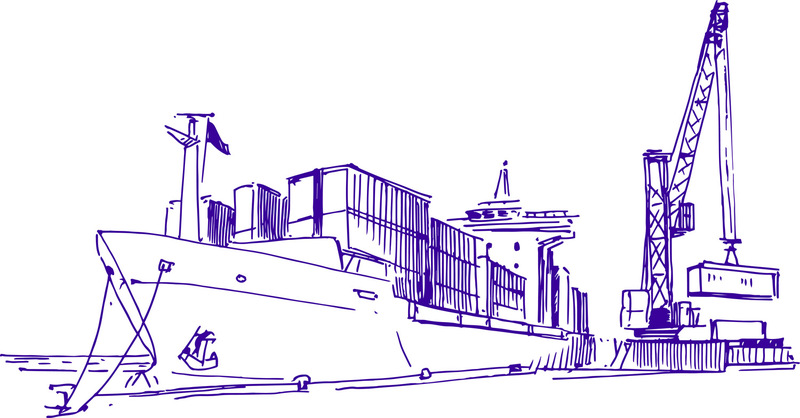 Al Tamimi & Company’s Transport & Insurance team regularly advises on shipping matters. For further information, please contact Omar Omar (o.omar@tamimi.com) or Adam Gray (a.gray@tamimi.com).